Reese’s Peanut Butter Cups have always been a favorite of mine! Chocolate and peanut butter just seem to blend so perfectly together and although I avoid the candy most of the time, they are one of those flavor combinations I try to incorporate into special occasions. These cupcakes are for those special times. In a medium-sized mixing bowl or the bowl of a stand mixer, mix butter and sugar. Add chocolate to the butter/sugar mix and combined. Sift flour, salt, baking soda, and cocoa powder into a separate medium bowl. Add dry ingredients to wet ingredients, mixing all together. Place 1 Reese’s peanut butter cup in each liner pushing lightly on it so it sinks into the cake mix. Add both the butter and peanut butter and beat on med. speed until smooth. 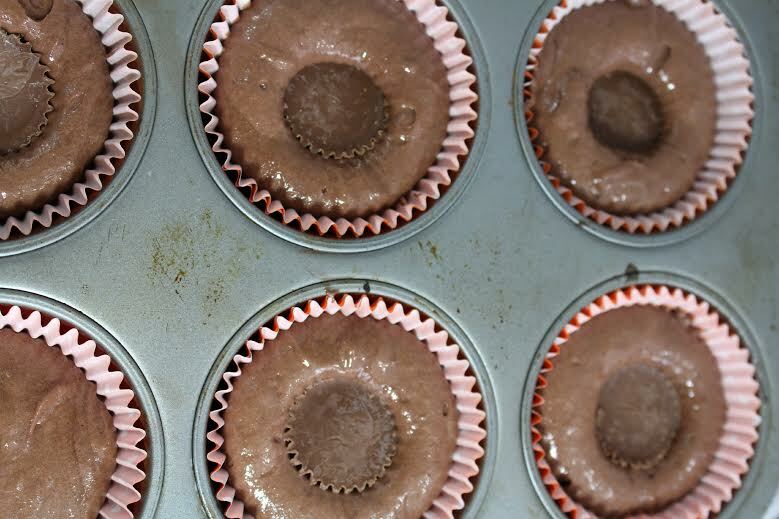 Place frosting in a pastry bag and pipe onto the top of the cupcakes. Absolutely DELICIOUS recipe idea!! Poor Francene – never had peanut butter cups? I wonder if this recipe could be adapted to be gluten-free! Oh my… these sound amazing! 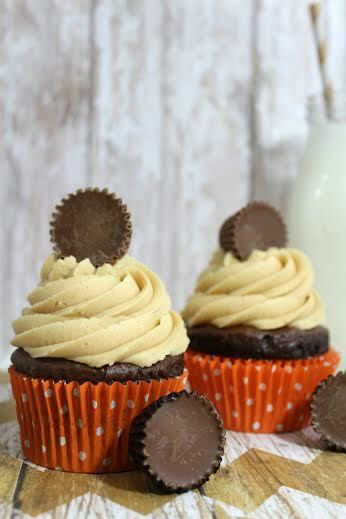 I absolutely love Reese’s Peanut Butter Cups, so will have to give these cupcakes a try. Thank you for sharing the recipe! What a delightful recipe. I could see using it for even an Easter dessert. It might even go over well when having friends with kids over for dinner. All I can say is Mmmm. I love Reese’s, too and your pictures look so festive. I’ve never heard of Reese’s peanut butter cups. Must be because I’m in England. But, I bet they make the cupcakes delicious. Looks yummy, I’ll have to try my hand at making these! These look amazing, but they sound even better! Filing this one to make after school dismisses for summer!